Alfie was born on 10th June 2007, weighing a healthy 8lbs 9oz. He seemed like any other child for the first 8 months and then one day, almost overnight, we noticed that one of Alfie’s legs was fatter than the other. We made an appointment with our local GP who then referred us to Royal Aberdeen Children’s Hospital. Alfie was examined and x-rayed where they found that the right leg was slightly longer in length and that his spine was slightly curved. They didn’t have an explanation as to why the leg was swollen. We then waited for an appointment to come through for an MRI scan to see what was going on inside the leg. This was done in December 2008 and the results of this were about to change our lives forever. We were referred down to Great Ormond Street Hospital, in London (600 miles from our home town), where Alfie was diagnosed with Lymphangiomatosis. The disease was in Alfie’s right leg and pelvic area. It also involved the marrow in certain bones. We were then told this disease was also causing him to have problems with his blood’s ability to clot. For a while things stayed as they were and then gradually his health went downhill, his leg became firmer to touch and started to turn yellow and then eventually black. This was over a few months. We thought it was just part of the condition and the Doctors in Aberdeen had no answers to our questions and the Doctors who had some experience in the condition were 600 miles away and we were only getting 6 monthly check-ups with them. On looking back we were so ignorant and it could have cost Alfie his life. One evening Alfie developed a large bruise on his arm for no reason. We took him to G-Doc’s (an out of hour’s surgery) and tried to explain to the doctor about Alfie’s condition and the bruised arm. The Doctor said, yes, it looked like he had bled into his arm but because it wasn’t a main artery we shouldn’t worry as he had probably knocked it. As we were due to attend GOSH we would be ok until then. Alfie also had a temperature—the doctor sent us home. Two days later, we flew down to GOSH in London for our 6 monthly review. On arrival Alfie was extremely pale, lethargic, and was running a temperature. Alfie was admitted straight away and there we stayed for 5 weeks. If we hadn’t been due for this review at GOSH I don’t think Alfie would be with us today. The next 5 weeks were the worst of our lives. Alfie had been bleeding internally, mainly into his leg and genital area for some time and this had become infected causing the high temperatures. We had one very sick child on our hands. His bloods were checked and it was discovered that his platelet count was dangerously low as was his fibrinogen (needed for clotting). He was given numerous intensive blood transfusions. Because of the multiple infusions and medication that would need to be given and the blood tests that would need to be done it was decided that a Hickman line should be fitted. The operation to insert the Hickman line went well but, because Alfie’s blood wasn’t clotting, the site where the line went in wouldn’t stop bleeding. We were told that if they couldn’t get the bleeding to stop there was very little they could do for Alfie. It took two days for the bleeding to stop. Over those two days we called our families and told them that we thought it would be a good idea if they came to see Alfie as he was very sick. My family travelled down from Suffolk and my husband’s mum travelled the 600 miles from Aberdeen to London with our eldest son. They were all shocked at what they saw. Alfie had always been thin and pale, but the events of the past few weeks made Alfie unrecognisable from the little boy he had been before. Luckily for us, Alfie is a fighter. His platelet count eventually came up, the bleeding stopped, and the temperature came down. On our fourth week at GOSH it was decided that they would start a drug called Vincristine, which is a type of chemotherapy, alongside prednisolone, a type of steroid. A week later we were allowed to come back up to Aberdeen Hospital to be monitored there and to finally be allowed home a further week later. Since then they have tried many times to reduce the vincristine and steroids but each time it just causes Alfie to bleed into his leg. He has now been on vincristine and steroids for over a year and this seems to keep his bloods levels stable. He suffers a lot of nerve and bone pain within his leg and is on 24 hour pain relief. He has battled numerous unexplained high temperatures, infections, and two fractured legs. 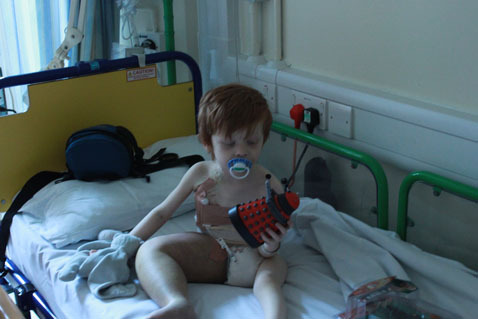 In September 2011, when Alfie was at his healthiest, the Doctors spoke to us about trying him on Rapamune/Sirolimus. He had tried it before but it just caused him to bleed internally, but this time they were going to give it to him alongside the Vincristine and steroids. Almost immediately we noticed a difference in Alfie’s well being. He was in less pain, so much happier in himself, and so far, he seems to be tolerating the cocktail of drugs that he is on. Things have settled down again and, although life is never going to be normal, the last few months have been as normal as we can hope for. Alfie has never walked because of his swollen leg but we try to stay positive and hope that one day he will walk. He has come on so much in the last six months and has now been given a walking frame to use as and when he can. If this disease has taught us one thing it is to live for now because you never know what will happen tomorrow. Finding the LGDA has given us hope and strength knowing that we are not alone.